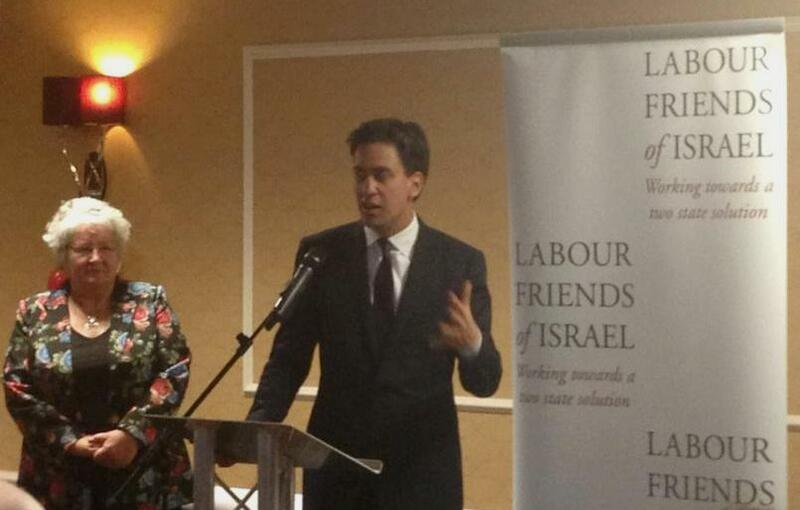 Addressing the LFI Annual Reception at Labour Party Conference in Brighton on 24 September, Labour Party Leader Ed Miliband said that he has a “profound admiration” for Israel, is “intolerant of those advocating boycotts of Israel,” and that he hopes to visit Israel in the near future. 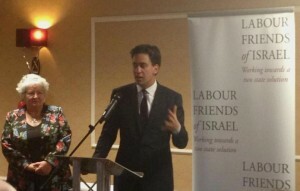 Reasserting the party’s support for Israel and a two state solution, Ed Miliband explained that “despite all of the difficulties, there is a glimmer of optimism about the negotiations,” adding “we should take hope from that, and grasp on to that glimmer of optimism, because I think it is what good people want: the two state solution that LFI believes in and that I believe in.” See further quotes from Ed Miliband below. LFI hosted special Israeli guest Labor party Member of the Knesset Hilik Bar at Labour Party Conference. Hilik is Secretary General of the Israeli Labor Party, Deputy Speaker of the Knesset, and leads the Israeli all party group for a two state solution. Addressing the LFI Annual Reception, Hilik Bar spoke of his delight of speaking to so many Labour Party members gathered to strengthen relations with Israel, and of the deep historic links between the British and Israeli Labour parties, going back to the socialist cooperative Kibbutzim of Israel’s founding. Remarking on the booming trade and research cooperation between the UK and Israel, Hilik praised Shadow Chancellor Ed Balls for launching the UK-Israel Economic Dialogue and called for the British and Israeli Labour movements to support each other in getting back to power. Hilik Bar said that the UK and Israel share the goals of achieving Israeli-Palestinian peace, resolving the crisis in Syria, ensuring the stability of Israel’s peace agreements with Egypt and Jordan and of stopping Iran becoming a nuclear power. He also asserted that the current Knesset has a clear majority for supporting a ‘two states for two peoples’ agreement, explaining: “What we need from you here in Europe is to assist and encourage the leaders of both peoples and then we will see that peace truly is within reach.” Please see Hilik’s full speech below. 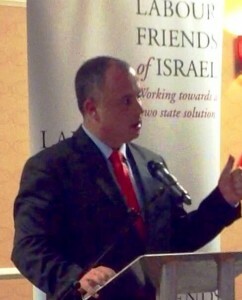 Also addressing the reception were Shadow Foreign Secretary Douglas Alexander and Israeli Ambassador Daniel Taub. Douglas Alexander called on friends of Israel “to be mindful of the regional turmoil surrounding Israel at this time, whether that is the tumultuous events in Egypt, the emerging security threat in Sinai; the fragility in Lebanon or the horror unfolding in Syria.” He added: “I want to echo Ed’s words of optimism in relation to the peace process. It would be remiss of me this evening not to place on record the Labour Party’s admiration for the work of US Secretary of State John Kerry. He has done an outstanding service to the international community since his appointment, and we wholly support his efforts to bring together the parties in the coming months.” Douglas also spoke of Labour’s support for the international community’s efforts to stop Iran from developing nuclear weapons. LFI Chair Rt Hon Anne McGuire MP said that she was incredibly honoured to welcome Hilik Bar, Ed Miliband, Douglas Alexander and Daniel Taub to the Annual Reception. It is a real honour and a pleasure to be here today sharing a platform with the Right Honourable Ed Miliband and Douglas Alexander, and LFI’s own Chairperson, the Right Honourable Anne McGuire. My Party Leader, Shelly Yachimovich, has asked me to pass her comradely greetings for a successful conference. I am also delighted to see so many Labour Party members gathered here to strengthen the relations with Israel. Members from numerous CLPs from across the UK. Indeed, I stand before you here today, not only as a Labour Member of Knesset, but as delegate to the UK Labour Conference from the Jerusalem Constituency. I would also like to praise the organisers of today’s event Jennifer Gerber and Ben Garratt, and all the LFI team. I wish to stress the importance of the work that Labour Friends of Israel, is undertaking in the UK Labour Party in promoting a true understanding of Israel, and the unique political and security challenges that we face. Jen and Ben – your work is greatly appreciated by the leadership of the Israeli Labour Party. The links between the Israeli Labour Party and British Labour Party go back a long way. We are both founding members of the Socialist International. Labour also has contributed to Israel’s security in a big way. It was Centurion tanks sold to Israel by Harold Wilson’s Labour Government that was a key element in our victory in the Six Day War and helped to ensure our survival as a state in the Yom Kippur War – exactly forty years ago. In recent years, the Labour Government of Tony Blair and Gordon Brown greatly expanded economic relations with Israel. Indeed, Israel’s first joint Research and Development with a European country was with Britain in the form of the “Bri-tech” project established in 2001. I would argue that a legacy of the Blair and Brown governments is the booming trade between our two countries. The UK is now Israel’s largest export market outside of the United States. Indeed, exports from Israel to Britain have increased by 55% over the last year. We exported $1.1 billion worth of pharmaceuticals thus helping to keep the British public healthy. Last year, your Shadow Chancellor, Ed Balls, established the UK-Israel Economic Dialogue in order to strengthen our vital bilateral relations. I am confident that the next British Government – will further deepen the ties between our two countries – and I am sure of that the next British Government will be led by Ed Miliband. Indeed, We had very warm relations with a whole range of Labour Leaders, be it Wilson, Kinnock, Blair, Brown and now with Ed Miliband. And indeed, I have come here not only to speak here, but to discuss strategies in our common endeavours against right-wing governments. We should do everything in our power to replace the right-wing governments in both of our countries. Not for the benefit of our parties, but for the benefit of the country and the society we live in. Labour governments are just better – the essence of the ideology we share is simply better that the alternative, and it is my true hope to see very soon the day when Britain and Israel will have Prime Ministers once again from the Labour Party. Allow me also to shortly share with you some thoughts on the upheavals in the Middle East. These are complex times. The Middle East is being reshaped in front of our eyes. For now Israel is not dramatically affected. Israel is deeply aware and sorrowful of the terrible price paid by our Arab neighbours as their countries go through these violent processes of change. We truly hope this turmoil will calm down sooner rather than later. With an eye to these interests, the Israeli Labour party provides Prime Minister Netanyahu with full support when it comes to any one of these issues. We also support Israel’s responsible and delicate cooperation with the new Egyptian government against terrorism in Sinai, and against the smuggling of arms into the Gaza Strip. to seriously advancing the Israeli-Palestinian peace process. Indeed, my own efforts as chairperson of the Knesset caucus for the Resolution of the Israeli-Arab Conflict – focus on advancing Israeli-Palestinian peace. And the two state solution is also what will allow Palestine to thrive. By the way, much of the caucus activity that we are doing is with the help and partnership of the One Voice organisation, whose people are also here tonight – and I want to thank them for the friendship and partnership. But, we have to be honest – the gaps between Prime Minister Netanyahu and President Abbas are wide. It is far from certain that they will succeed in bridging them, though at the same time one should not assume they are unbridgeable or give up. This Knesset has a clear majority of 70 MKs out of 120 supporting a “two states for two peoples” agreement. The Knesset Caucus I chair puts together many conferences, meetings and media appearances to remind the government and the public of this clear majority, and to encourage the Prime Minister to make use of this unique political opportunity. There are negotiations between Israel and the PLO these days. We should do everything in our power in order for these negotiations to succeed. Whether they succeed or fail, as long as they make a genuine effort – they should be supported by all us – inside and outside the Middle East. They should be supported because we should not miss an opportunity to make peace. The two state solution, whether it will be achieved in this iteration or in another, is the only possible solution. Attempts to promote it must continue and the commitment of the Israeli peace camp and the international community to it needs to be maintained. It is not becoming easier to reach this solution, but do not believe those who argue this solution is becoming impossible. What we need from you here in Europe is to assist and encourage the leaders of both peoples and then we will see that peace truly is within reach. Just recently, the caucus I’m chairing hosted the first formal delegation of Palestinian parliamentarians and key figures at the Knesset – with the blessing of President Mahmoud Abbas. It was the first time that a formal Palestinian delegation had visited and entered the Knesset with the blessing of the Palestinian President. It was a show of unity from both sides in support of the Israeli – Palestinian negotiations. 36 Knesset members and 2 government ministers, plenty of media and hundreds of spectators were also there in order to tell the leaderships of both sides: we are behind you, to support you to go ahead and bring us peace. To conclude, for the peace talks succeed, those wanting to support the two state solution should partner together and create the most empowering environment possible. We must establish domestic and international partners that both Israelis and Palestinians will need if they are to be brave and move towards a better future. We need these kind of partners. And, on behalf of the Israeli Labour Party, allow me to tell you that I cannot imagine a better partner for such an effort than the British Labour Party. I wish for both of our parties to go back to the days when the phrase “Sister Parties” is a reality and not just a phrase, and I wish us all much success in bringing the two state solution from a distant dream into reality. I wish for us all to deal bravely and wisely with global challenges we all have – challenges of global terror and global economy. But above all – in order to meet all of these challenges – I wish for the people and voters of both of our great nations to be smart enough and to make sure they will have a very big and strong Labour party to lead the country and to form the next government. In both Israel and in Great Britain.